BRLPS Recruitment 2019 - Apply Online for 247 Block Coordinator, District Consultant & Other Posts in BRLPS, Bihar. Online Applications are invited by Bihar Rural Livelihoods Promotion Society (JEEViKA) from 26 Mar 2019 to 22 Apr 2019 for 247 vacancies. State Consultant-MLE & MIS 01 Graduate in Engineering with a specialisation in Computer science or Information Technology OR Post Graduate in Social work/ MBA/Rural Management/Rural Development /Public Policy/ Statistics or Actuarial sciences (Recognised by The Institute of Actuaries of India (IAI)), Operation Research from recognized institute. Should have minimum 5 years of relevant post qualification experience. Post Graduate in Commerce from a recognized institute/university with minimum 2 years of post-qualification relevant experience in bookkeeping, accounts related job and secretarial assistance with reputed institutions, Government programmes/ project or Social Sector Projects. Or Graduate in Commerce from recognized institute/university with minimum 3 years of post-qualification relevant experience in bookkeeping, accounts related job and secretarial assistance with reputed institutions, Government programmes/ project or Social Sector Projects. Knowledge of working on the computer and operating Tally Software will be essential. Typing skill in Hindi and English would have an advantage. Post qualification experience of at least Seven (7) Years in project Management/SLWM etc. Post Graduate/Graduate in Management with experience in SLWM/Engineering/Urban-Rural Planning/Environment discipline. Post Qualification experience of at least Five (5) Years in SLWM/Project implementation for Post Graduates and Seven (7) Years for Graduates. Graduate in Communication/Journalism with experience in undertaking IEC/Capacity building initiatives in the national/state program. Consultant-Technical Sanitation (ODF-S Cell) 01 Graduate in Environmental or Civil Engineering with experience in toilet technologies/Retrofitting etc. Post qualification experience of at least Five (5) years in toilet technologies. District Coordinator 06 Graduate in any discipline with preference to Post Graduate/ MBA with a minimum 5 years of post qualification experience in the area of social/ rural development/ Social work (at least 2 years at district level). Candidates with experience in Community Mobilization, Community Led Total Sanitation (CLTS) and Water Sanitation and Health (WASH)/ rural water supply and sanitation sectors would have an advantage. District Consultant-CB & IEC 21 Post Graduate Degree in Human Resource Management/ Business Administration/ Rural Management/ Social Work/ Rural Development or Public Health from a recognized institute with a minimum 3 years’ post qualification experience in the area of Capacity Building and Training in the field of Public Health / WASH / Social/ Rural Development projects. Candidates with experience in Community Led Total Sanitation (CLTS) and Water Sanitation and Health (WASH)/ rural water supply and sanitation sectors would have an advantage. Candidates with experience in successfully managing training and capacity building events in Hygiene, ODF, Sanitation/community-based programmes would be preferred. District Consultant-MLE & MIS 27 Graduate in Engineering with specialization in Computer Science or Information Technology or a Graduate in Statistics, Actuarial Sciences (Recognized by The Institute of Actuaries of India (IAI)) from a recognized institute with minimum 5 years’ of post-qualification experience in undertaking Data Analytics, Data Mining and MIS related works in Social Sector projects. Knowledge and understanding of Banking and Business Processes would be an advantage. Proficiency in English is mandatory. Proficiency in using tools like MS Excel, SPSS, CSPro, Matlab, and other data tools will be an advantage. District Consultant-SLWM 32 Post Graduate Degree in Environmental Science, Rural Development, Social Work, or Graduate Degree in Environmental Engineering, Civil Engineering or Agriculture from a recognized institute with minimum 5 years’ post-qualification experience in implementing and running Solid And Liquid Waste Management Processes including Collection, Treatment, Recycle and Safe Disposal. Block Coordinator 155 Postgraduate degree /diploma in rural management/ development/MSW with minimum 2 years of post qualification experience in the area of social development/ rural development OR Graduate in any discipline with minimum 3 years of post qualification experience in the areas of social development/rural development/Social work. S/he should have a working knowledge of MS Office. Preference would be given to those candidates having experience of working on Water and Sanitation. Eligible candidates may apply online at BRLPS's website (direct link is given below) from 26 Mar 2019 to 22 Apr 2019. BRLPS Recruitment 2019 - Apply Online for 3409 Community Coordinator, Accountant & Other Posts in BRLPS, Bihar. 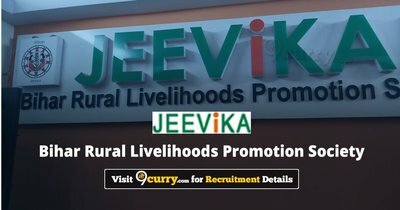 Online Applications are invited by Bihar Rural Livelihoods Promotion Society (JEEViKA) from 18 Mar 2019 to 22 Apr 2019 for 3,409 vacancies.